Getting there! 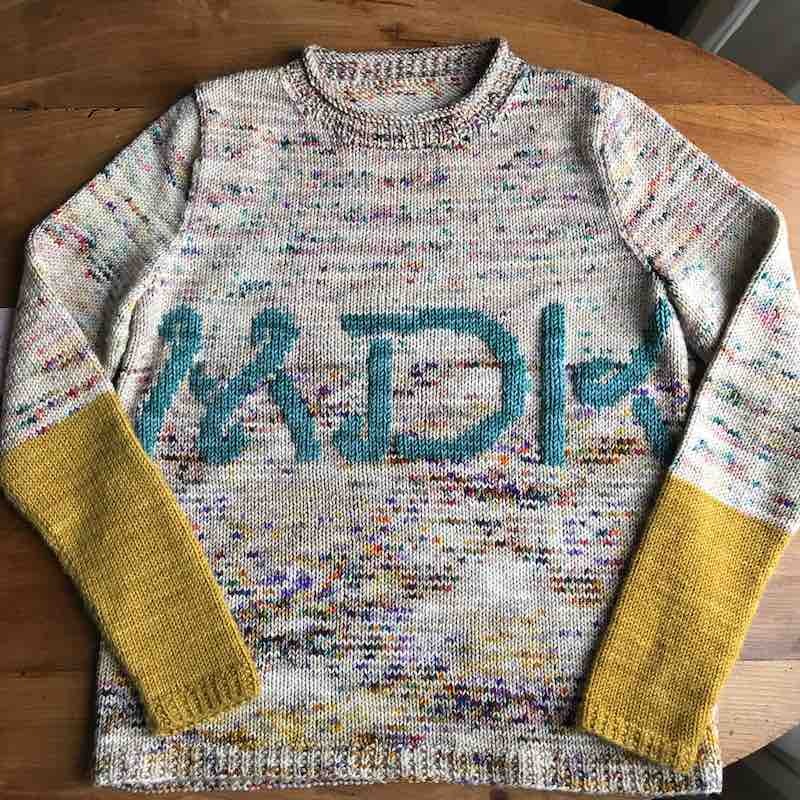 My queue of MDK March Mayhem projects is down to 62, now that I am well on my way with the Papa pullover by Junko Okamoto. You know Papa: it’s that pullover with the winsome flowers that look to have been doodled all over it. Junko Okamoto thoughtfully provides us with a chart, 50 rows high and 90 stitches wide, for working the flowers in stranded knitting—you know, working two colors alternately in a round. The chart must be worked four times to cover the front and back of Papa. There is absolutely no repetition or rhythm to the chart. Every stitch is an adventure. Couldn’t a person stitch the flowers rather than strand them? As you may recall, I’ve been in something of a duplicate stitch mood recently. Let’s break down the pros and cons of duplicate stitch versus stranding for this project. 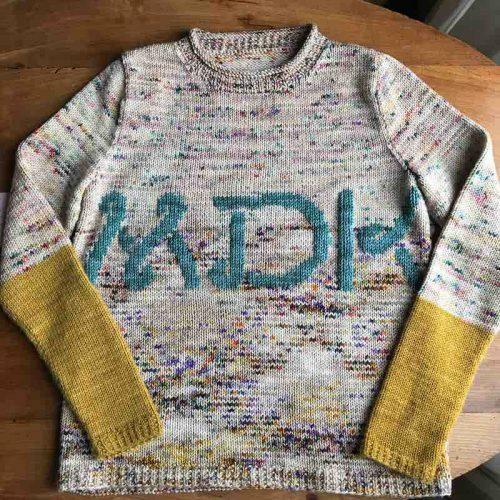 • If you love to knit stranded colorwork, this is a good workout of your skills. • The stitches for the flowers are integral to the fabric—they don’t sit atop the background. This is a design choice: do you want dimensional flowers or a fabric with flowers built in? Duplicate stitch creates a dimensional effect. 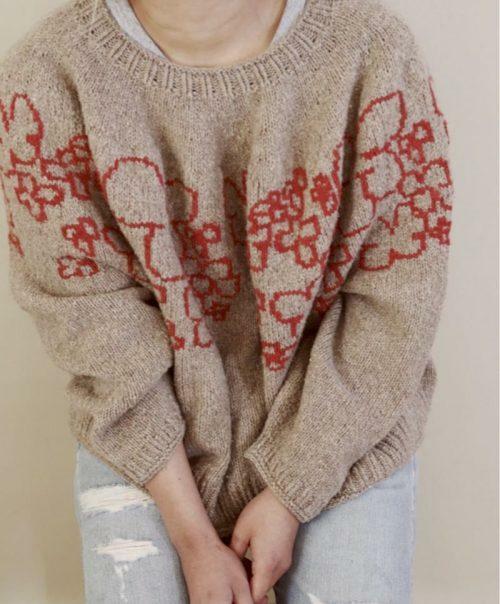 • You get to make the flowers pretty early in the creation of this sweater. The flowers are what this sweater is all about. A person wants to get to the flowers as soon as possible. • The strands on the back might show through if you use a very light main color and very dark color for the flowers. • The colorwork makes the fabric double thick for the flower section, due to the strands carried on the back side. 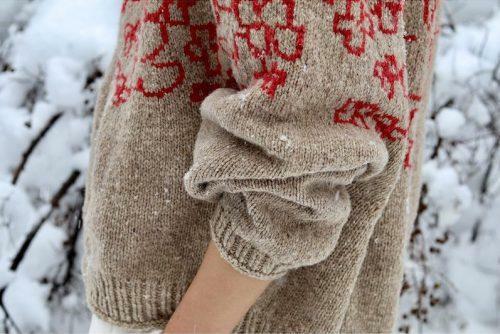 It’s a single thickness elsewhere in the pullover. • Should you go down a needle size for the stockinette part? The pattern suggests this in case your colorwork comes in a tighter gauge than one-color work. This is basically a shot in the dark unless you’ve swatched in the round. (Confession: I have never done that and never will.) Who knows if your stitches will look better or worse? • You can’t really tell how your stranding will turn out until you’ve finished the entire sweater and blocked it. My stranded knitting looks tons better after I’ve given it a good soak and blocking. But with such irregular floats and single stitches, Papa is a pretty challenging piece of colorwork. Puckering, pooching, too tight, too loose—all are possible problems here. • Duplicate stitch is very much like counted cross stitch embroidery. The background of stitches is the grid. It goes pretty quickly when you load up a tapestry needle and just get to it. • The stitches have a bit of dimensionality to them, making the flowers stand out. A design choice, whether the flowers should be flat in the fabric as with stranded knitting, or raised a bit with duplicate stitch. • It’s easy to take out irregular parts or to fix mistakes if you discover you’ve made a mistake. Duplicate stitch is done on the surface of the finished knitted background, so you can snip out a problem area and redo it without affecting other stitches around it. • Duplicate stitch is no fun if you don’t like stitching! • Duplicate stitch follows the shape of the flowers. The chart can be hard to follow when you’re stitching these irregular flower shapes—you can overlook a flower by mistake if you’re, say, binge watching Scandal and Olivia Pope is really chewing somebody out. There’s a lot of eyeballing and checking back at the chart to make sure you didn’t blow a column of stitches. Not sure if this is more anxiety provoking than having to check the chart when stranding the colorwork, which lets you at least mark the row you’re on with a bunch of sticky notes. • You don’t get to make the flowers until you’ve knit the whole sweater. Maybe that’s not true. Maybe you can make the flowers before you finish the body. Maybe you can knit the 50 rounds for the background on which the flowers are to be stitched, then knit a number of rounds after that. Then put all live stitches on waste yarn and get to the duplicate stitching right away. I think this is a pretty decent idea. Even though duplicate stitch is worked on the front side of the fabric, it will be easier to handle if there aren’t sleeves and a long torso flapping around. I think I just answered my own question. I’m definitely going with duplicate stitch. Unless, of course, I get out a fat Sharpie, doodle the doodles, and call it a day. PS We carry this yarn in the MDK Shop, Lana Plantae Rambouillet DK, in Cochineal and Sumac. The hot pink is stunning. A natural dye derived from teeny red bugs? Pretty cool.